First Christian Church - SERMONS - What Will You Give to Jesus? At this time of year our thoughts turn toward the birth of Jesus Christ and all its associated miraculous events. This story has been told for over 2000 years, and yet every time we read it, or hear it, there is always something new that ministers to our heart. This morning I want to draw your attention to the Wise Men, those kings from the east, who arrived at some point after Jesus was born. Matthew 2:1-12 Now after Jesus was born in Bethlehem of Judea in the days of Herod the king, behold, wise men from the east came to Jerusalem, saying, “Where is he who has been born king of the Jews? For we saw his star when it rose and have come to worship him.” When Herod the king heard this, he was troubled, and all Jerusalem with him; and assembling all the chief priests and scribes of the people, he inquired of them where the Christ was to be born. They told him, “In Bethlehem of Judea, for so it is written by the prophet: “‘And you, O Bethlehem, in the land of Judah, are by no means least among the rulers of Judah; for from you shall come a ruler who will shepherd my people Israel.’” Then Herod summoned the wise men secretly and ascertained from them what time the star had appeared. And he sent them to Bethlehem, saying, “Go and search diligently for the child, and when you have found him, bring me word, that I too may come and worship him.” After listening to the king, they went on their way. And behold, the star that they had seen when it rose went before them until it came to rest over the place where the child was. When they saw the star, they rejoiced exceedingly with great joy. And going into the house they saw the child with Mary his mother, and they fell down and worshiped him. Then, opening their treasures, they offered him gifts, gold and frankincense and myrrh. And being warned in a dream not to return to Herod, they departed to their own country by another way. Contrary to our traditions and Nativity sets, the visit of the wise men didn’t happen on the same night that Jesus was born in a stable and laid in a manger. They visited sometime after Jesus was born. The Scripture says they found Him in a house. We don’t know how old Jesus was when they came, but Herod attempted to kill Jesus by killing all males 2 years and younger in and around Bethlehem. Matthew 2:16 Then Herod, when he saw that he had been tricked by the wise men, became furious, and he sent and killed all the male children in Bethlehem and in all that region who were two years old or under, according to the time that he had ascertained from the wise men. 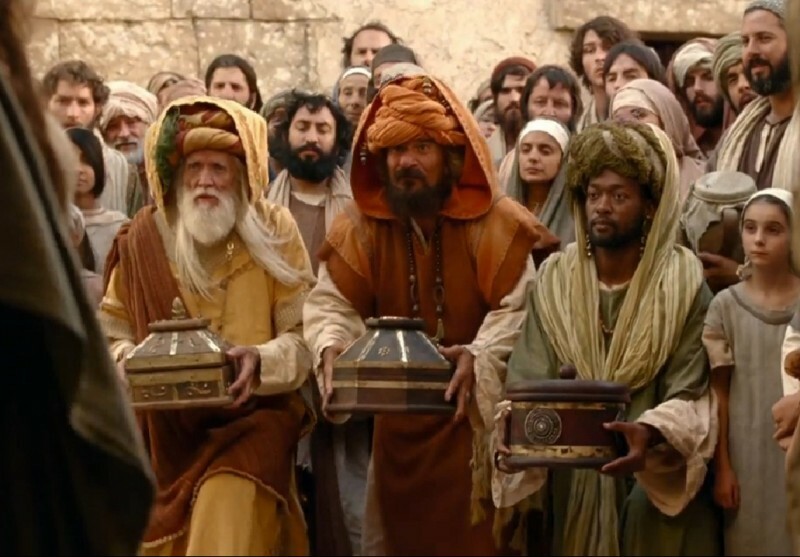 Regardless of when they visited Jesus, let’s consider the gifts the kings brought to Him. Their gifts were unusual for a baby or toddler. They didn’t bring any toys, nor anything little Jesus could enjoy or use. Their gifts seemed inappropriate. Nevertheless, the gifts were prophetic and very appropriate because they knew Jesus is the Messiah—Immanuel, God with us. The first gift was gold. Ironically, man’s most expensive gift to give Jesus was something that is used to pave the streets where Jesus had come from! Jesus could have wondered why they gave him a box of gravel, but He probably didn’t, since He was fully man as well as fully God. This gold symbolized Jesus’ royalty as the King of Heaven and the King of Earth. He is King of Kings, and Lord of Lords. The second gift was frankincense. This was a perfume resin that was one of the ingredients in the incense used at the Altar of Incense in the Tabernacle. It’s symbolic of Jesus’ high priesthood and its odor represented the prayers that rose before God’s throne in Heaven. The third gift was myrrh. Myrrh is first mentioned in the Old Testament as a principal ingredient of the holy anointing oil used in the Temple. The oil was used to anoint priests for service and kings for their office. In the New Testament we see it used for other things. Mark 15:23 And they offered him (Jesus) wine mixed with myrrh, but he did not take it. As we see at the crucifixion of Christ, myrrh was also mingled with wine to numb the pain of crucifixion. Jesus never accepted the myrrh, but endured all of the pain for you and me. Myrrh was also used in the preparation of a body for burial. John 19:39-40 Nicodemus also, who earlier had come to Jesus by night, came bringing a mixture of myrrh and aloes, about seventy-five pounds in weight. So they took the body of Jesus and bound it in linen cloths with the spices, as is the burial custom of the Jews. The implications of the myrrh as a gift are clear to us now. It was pointing to the day when Jesus would be crucified, and then be prepared for burial. It was also pointing to the day when he would be anointed eternal High Priest and crowned as the King of Glory. Therefore, the gold, frankincense, and myrrh brought to Jesus by the wise men had a lot of symbolism. They identified Him as the Messiah, and through His death, burial, and resurrection, the sting of death would be forever removed for those who accept Jesus as Lord and Savior. However, these were not the most important gift that the kings brought that day. The most important gift that they brought nearly goes unnoticed by most people. What was that gift? These men were kings. It was the gift of their submission to Christ’s rule over them, and their worship of Him as King of Kings. The gifts of gold, frankincense, and myrrh were gifts of sacrifice, for they cost the kings something. But the gift of submission is much more valuable to the LORD. This story of the wise men summons each one of us to consider what we need to give Jesus. How are we going to respond to Immanuel, God with us? Will we submit to the King of Kings and His authority over our lives? Submission is one gift we can give to Jesus. There are others. Jesus already has all of the wealth of Heaven and earth, yet He accepts our gold and blesses us for giving to Him a portion of our wealth though tithes and offerings to meet the needs of His Church and the needs of others. God loves a cheerful giver, but not just a cheerful giver of our tithes and offerings. He also wants our cheerful gifts of thanksgiving, praise, and worship. Wise men still worship Jesus. Throughout the day we can worship the Lord with thanksgiving and praise. We can also worship Jesus by making our bodies a living sacrifice to Him, to do as He pleases with us. Romans 12:1 Therefore, I urge you, brothers, in view of God’s mercy, to offer your bodies as a living sacrifices, holy and pleasing to God—this is your spiritual act of worship. The most valuable gift you can give Jesus is the gift of yourself. Just as the Magi brought gifts of gold, frankincense, and myrrh, each of us bears unique and valuable gifts for the Kingdom of God. Jesus wants us to give whatever gifts we have for the benefit of His Body, the Church. We are all members of Christ’s body, and our gifts, whatever they may be, are meant to serve one another so that the love of Christ may shine brightly in, around, and forth from the fellowship that we share together. In doing so, we are giving to the Body of Christ and we are a testimony to the world that we are Jesus’ disciples because we have love for one another. 1 Corinthians 12:25-27 that there may be no division in the body, but that the members may have the same care for one another. If one member suffers, all suffer together; if one member is honored, all rejoice together. Now you are the body of Christ and individually members of it. The mission of the Church is twofold; to edify the Body of Christ and to share the love of Christ with this world which is in desperate need of the Gospel and the Word of God. All around us are people, who are suffering the consequences of sin, because they do not know Jesus nor the Word of God. We know the answer—Jesus! How will they know if we don’t tell them? This is our commission from Jesus. Wherever we go, we are to minister in His name, but often we feel unqualified for the task. A lack of confidence in our ability to minister in the Name of Jesus reflects much more than simply a lack of confidence in ourselves; it reflects a lack of understanding of the true nature of the power of God to enable us to do what He commands. Acts 1:8 But you will receive power when the Holy Spirit comes upon you, and you will be my witnesses in Jerusalem and in all Judea and Samaria, and to the ends of the earth. As followers of Christ, ask for the Holy Spirit every day. Then, by faith, walk according to the Holy Spirit by obeying every command He gives you. Deny all thoughts and feelings from the flesh and the devil. The power of God will work in you to accomplish His will. No matter how young or old you may be, regardless of how rich or poor you are, each of us has a distinct purpose and function in the Kingdom. Each of us has unique gifts that are meant for building up one another and for the building up of the kingdom of God. We don’t have to rely on our own ability. We have been blessed with the very presence of God, the Holy Spirit within us, to enable us for every good work. That Spirit-led service is a gift to Jesus. Our commission makes us ambassadors of Christ in this world, with a mission to share the love of God by the power of His Holy Spirit within us. As we go, the Holy Spirit will lead us to pray—the most powerful action we can do for people. It is in loving others and sharing the Gospel that we can give to Jesus. However, before we can love others, we must first love Jesus. Our love is another gift Jesus desires. Loving Jesus means we keep His commandments. John 14:15,21,23-24 15 If you love me, you will keep my commandments… 21 Whoever has my commandments and keeps them, he it is who loves me. And he who loves me will be loved by my Father, and I will love him and manifest myself to him…” 23 Jesus answered him, “If anyone loves me, he will keep my word, and my Father will love him, and we will come to him and make our home with him. 24 Whoever does not love me does not keep my words. And the word that you hear is not mine but the Father’s who sent me. Love for Jesus is that state of the heart in which everything - our whole life, being, and possessions - are a continual offering to Him. True love is complete dedication, extending to all times, places, employments, thoughts, and feelings to the lordship of Jesus Christ. We love Jesus when He is the object of our supreme affection, in which we not only live and move in the power of Christ, but for Christ. In other words, we love Jesus when our attention is diverted from self and self-seeking, and is directed to Jesus - our thoughts, purposes, desires, affections, and emotions all hanging upon, and devoted to Him. When we give Jesus our love and obedience, we also give Him all our rights to self-rule. Will you give yourself to Jesus, willingly, cheerfully, and wholeheartedly? That’s the gift that Jesus wants more than anything else. The most valuable gifts we can bring Him are our love, submission, obedience, loyalty, trust, thanksgiving, praise, worship, and service. Money can’t buy these valuable gifts. They are worth more than gold, frankincense, and myrrh. Therefore, daily worship Jesus, who takes away the sin of the world—my sin and your sin. Thank Jesus for His love that held Him to the cross, when nails could not have done it. Praise Jesus for laying down His life willingly, for no demons of hell, nor soldiers of the mighty Roman Army could have held Him if Jesus had not surrendered willingly. What Jesus did through His birth, life, death, and resurrection will stand for all eternity. After Jesus ascended into Heaven, Jesus gave us another gift, the gift of the Holy Spirit, His Spirit, to be in us—to comfort us, guide us, and empower us. He is Immanuel, God with us. God’s gifts are eternal, supernatural, and each one is more valuable than all the wealth of the world. The Father gave His most precious gift to us—His Son, Jesus. Why? Because He loves us. Jesus has given us His most precious gift—His Life. Why? Because He loves us. God wants to give us the gift of Himself—the Holy Spirit—so that we can have an intimate relationship with Him and have grace and power to do His will. Will you receive God’s gifts? Many people never receive and open the gifts that God has given them. How would you feel if you gave everything to give someone a valuable gift because you love them and they never took it or opened it? When we appreciate someone’s gift, we naturally want to give them something, too. If you could give a gift to Jesus, what would it be? How about your life? After all, He gave His life for you. Until you exchange gifts with Jesus by receiving the gift of eternal life that Jesus has given to you and giving your life to Jesus, you will die in your sin and go to Hell. It won’t matter how good you have been or how charitable you have been. Neither will it matter how bad you have been. We have all sinned, and therefore, we are all damned with an eternal death sentence in Hell. Jesus left Heaven and came to earth, born of a woman, to live perfectly for us and die in our place on the cross so we wouldn’t have to suffer that damnation. When we give Jesus our life, that death sentence is what we are giving up to receive His gift of eternal life. You can gain eternal life today by giving up your life to Jesus. There is nothing to profit, nothing to gain eternally by remaining in control of your life. But if you will deny yourself, take up your cross, and follow Jesus, your life will be saved eternally and you will begin to experience God’s love, peace, joy, and presence in your life today and forever. If that is your desire, come forward during the invitational hymn and confess that you believe Jesus Christ is the Son of God who atoned for your sin on the Cross. Repent of being your own god and give your life to Jesus by dying to yourself in baptism. Then you will be born again. The characteristic of the new birth is that you yield ourselves so completely to God that Christ is formed in you. Immediately Christ is formed in you, His nature begins to work through you. The gift of the Holy Spirit, who will empower you to give Jesus gifts of submission, worship, praise, thanksgiving, service, ministry, love, and obedience.